This book has a lot of reviews under 3 stars, but I don’t really care about the fact that the author isn’t poor or has nannies. I only care about how she went about creating order in her life. She is brutally honest, and while I agree with some of the reviewers that she does seem to brag about herself at times, she is also very open about her faults. She tells that she found it hard while trying to be nice to her husband for a week. People got all upset by this. Why? Have you ever tried to be nothing but nice and loving to your husband for a whole week? Let me tell you, it’s hard. They tend to get on your nerves from time to time, and I’m sure they’d say the same about us. Some of the sections I found interesting were Remember Love, Make Time For Friends, Boost Energy. My favorite though was Toss, Restore, Organize. I’ve been working on that the last few weeks, and while it’s not my favorite thing to do, it sure makes you feel better once a project is finished. I’ve checked the ones I plan on using. While I didn’t agree with everything the author said, I really liked this book, and don’t understand all the negative comments. Maybe those who wrote them need to work on the tip “7 Tips for being a more lighthearted person”. 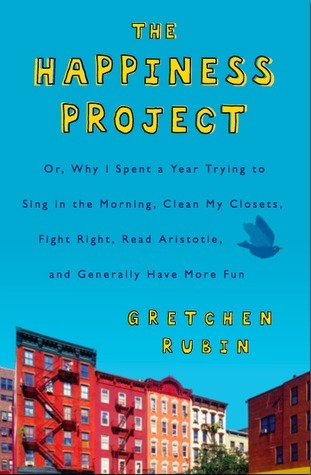 I think this would be a great book for anyone wanting to not only organize their closets and pantry, but to improve their fitness, relationships and thinking. I’m glad you got something out of it! The tips lists aren’t in the hardback version that I got at the library, but Gretchen has a lot of things like that on her blog. I bought this for a gift for my cousin but she was sort of noncommital when I asked her about it. I need to read it for myself, I think.